Mountain bike 71 miles on the North Rim trail. Get 6 months to pay $950.00 with PayPal Credit! No payments + no interest if paid in full in 6 months. Ride 71 miles of remote country on the Grand Canyon’s North Rim, pushing your limits on a full-suspension Santa Cruz mountain bike. 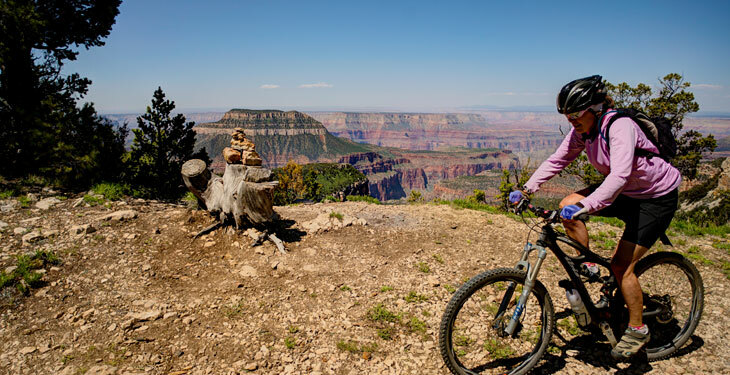 This four-day mountain biking adventure will take you along the North Rim of the Grand Canyon. Often listed as one of the Seven Wonders of the Natural World, the Grand Canyon is popular for hiking, backpacking, and rafting enthusiasts. Although largely protected from mountain bikers due to its national park status, this trip allows you to ride along some of the most remote country in the continental United States. 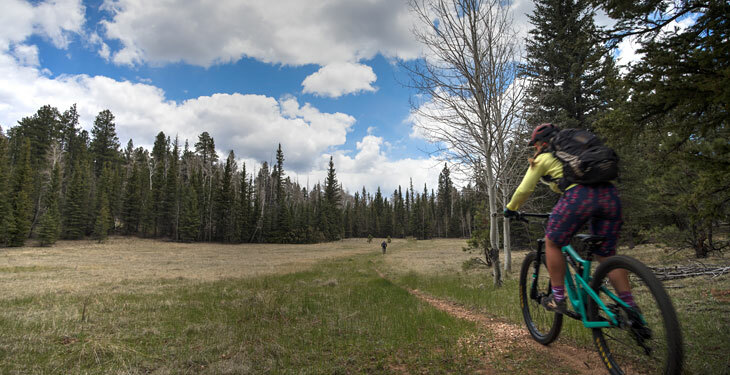 Rising high above the magnificent canyons carved by the Colorado River, the Kaibab Plateau offers outstanding mountain biking combined with spectacular scenery. 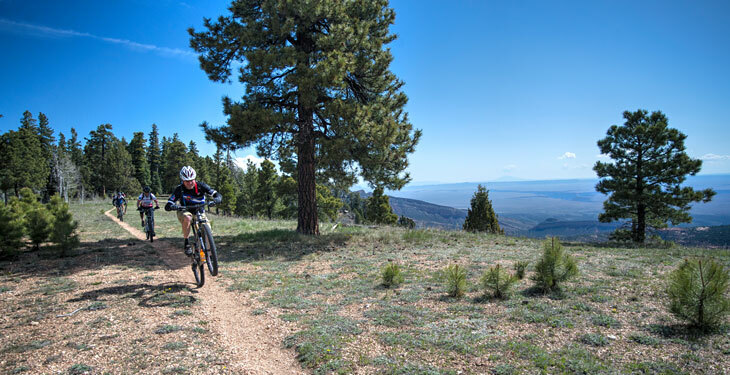 Pedal through Ponderosa Pine and Aspen forests, with rolling terrain between 8,000 and 9,000 feet, and ride on flowing singletrack and untraveled forest roads. Dine on healthy, fresh, delicious meals, kick back around the campfire in good company, and camp under the stars on this unforgettable adventure. Plan on arriving in St. George, Utah the day before the start of your trip to ensure you are ready for the early trip start on day 1. Accommodations are not included on this night and will need to be arranged. Meet your guides at 8:00 am on the morning of your departure at the Lexington Inn in St. George, Utah. Your guides will take care of any last minute logistics and load the support vehicle, before you make the three-hour drive to the trailhead. Unload your bike and gear and ride a section of the Arizona Trail (the full trail runs north to south across the entire state of Arizona). The trail consists of mostly smooth, rolling singletrack with several steep climbs and descents. Meet up with the truck mid-day for a tasty buffet lunch before heading towards the East Rim Overlook, with your first views of the magnificent canyons below. 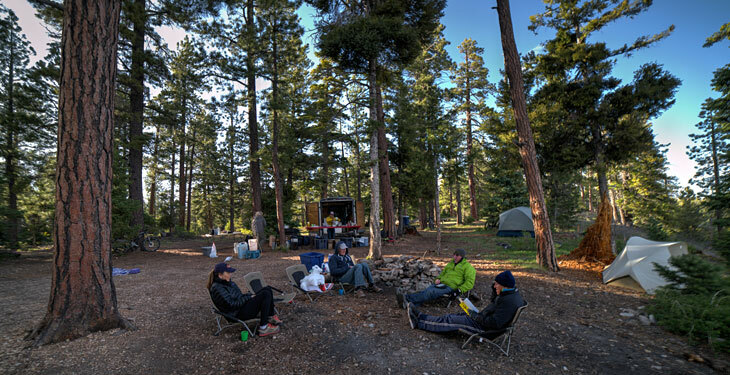 Help set up camp while your guides prepare meals, head out for a hike, or lounge around the forested campsite with a book. Begin the day with three miles of rolling singletrack, and then alternate to forest service roads. The terrain is moderate, with a good amount of downhill in addition to several climbs you must conquer before reaching camp at Locust Point. 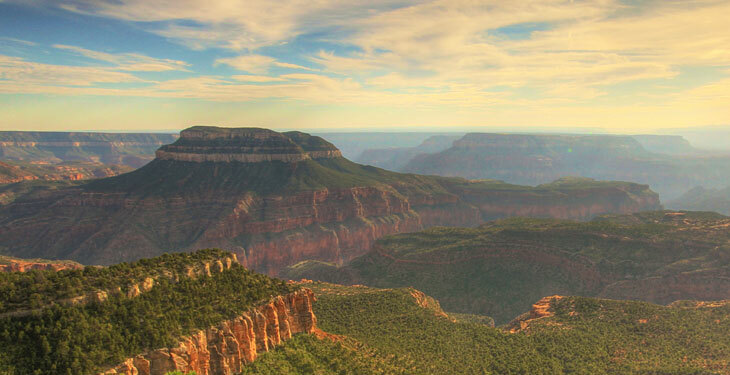 Here, you’ll camp for two nights right on the magnificent North Rim of the Grand Canyon. The views are amazing, and the sunrises, sunsets, and stars are sublime. 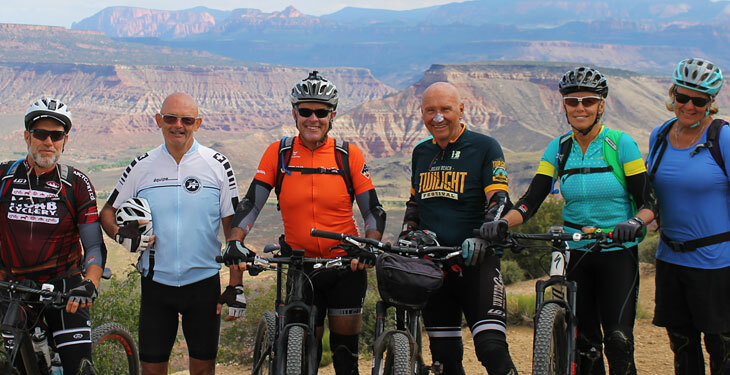 Explore Rainbow Rim trail, an incredibly scenic trail designed by the Kaibab Ranger District with mountain bikers in mind. The fast carving singletrack winds right along the rim of the Kaibab Plateau with outstanding views into the Grand Canyon. Carry lunch on the out and back ride to Timp Point, or make it a loop by adding 10 miles of jeep roads. Continue riding the rest of the Rainbow Rim trail, nine miles to its end at Parissawampitts Point. Finish riding by noon, enjoy a delicious lunch, and shuttle back to St. George. You’ll arrive between 5:00 and 6:00 pm, so its best to make lodging arrangements in advance. Rim Tours' customer service philosophy stems from the fact that they simply love what they do: showing people spectacular places and how to mountain bike in a fun, safe, and responsible way. They work hard to ensure that each guest has the best possible experience, from the first time they reach out to a potential multi-year relationship down the road. Rim Tours realizes that guests' vacation time is valuable and feel truly privileged to have earned the opportunity to provide adventures of a lifetime! If you are looking for a sweet ride and for being well taken care of and well fed along the journey in the desert then look no further. If you are looking for a memorable way to see the desert (White Rim/Grand Canyon) then stop looking you found it! Rim Tours handles all the details so you can just show up ride and enjoy the scenery. On my tour we had folks as young as college age all the way to retired marines - fun for all ages and if you can't keep up you can always hop on the slow bus that follows the group with supplies. The total ride sounds long but each day you only ride 20 or so miles and there is time at the end of the day to explore and relax by the camp. This was our second Rim Tours mountain biking multi-day trip, and we had a great trip (as expected!). 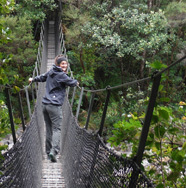 Rim Tours provides outstanding service and delivers a memorable vacation. The guides are outstanding, the trials wonderful, the bikes awesome and the food better than we eat at home. I would highly recommend Rim Tours to everyone—great people, great trip, great scenery, great food, and we got our dishes done... bonus ball! Both Rob and Bobby were very knowledgable about the area, the geology, and the history of the area. They are also very good cooks. I appreciated the map talks to get a visual of where we were going. Please note there is a minimum number of 4 participants required in order to guarantee each departure. Please wait until you receive confirmation from Rim Tours before making any travel arrangements. What’s the best way to get to St. George, Utah? You can fly directly into St. George from either Salt Lake City or Los Angeles. Alternatively, you can fly into Salt Lake or Las Vegas and take a ground shuttle to St. George. If you’d prefer to drive, you can leave cars at the Lexington Inn in St. George. 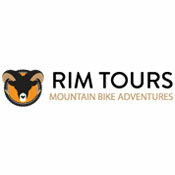 What type of bikes does Rim Tours have available for rent? Rim Tours has full-suspension Santa Cruz mountain bikes available for rent (included in cost) and upgraded bikes may be available for $120 extra per day. Helmets are also supplied, but it is recommended that you bring your own clip-in pedals and shoes if possible. You have the option to purchase bike rental insurance for $15 to cover any damages to your bike while in your care. If you are bringing your own bike, Rim Tours strongly recommends that you have your bike checked out by a reputable shop prior to departure. Rim Tours can help you coordinate shipment and building of your bike. What will I be responsible for carrying while riding? Due to the nature of the route, the support truck will not be able to accompany riders on all sections of the route, but will touch base with the group at least once per day at lunchtime. Therefore, you’ll be responsible for carrying snacks, water, and gear for the day’s ride, including rain gear, some warm clothing, a spare tube, and patch kit. The guides will carry first aid supplies and other tools. What are the accommodations like? Do I need to bring my own camping gear? No—all camping equipment (tent, sleeping bag, sleeping pad) is included in the cost, and will be transported in the support vehicle. You'll just need to bring a small daypack with personal items and clothing. Yes, anyone may have their own tent at no extra cost. Rim Tours carries a solar shower and washbasins. Depending on group size and weather, solar showers are usually available every other day, while washbasins are available every day. Unscented baby wipes work great for quick cleanup after riding. You won’t be disappointed with the culinary skills of the Rim Tours staff. They serve delicious energy-packed meals with a lot of variety to satisfy all tastes. They can accommodate special diets, and provide sodas, lemonade, Gatorade, and plenty of water. Alcoholic beverages are not provided, but feel free to bring your own. Most expenses are included in the trip cost. Plan on bringing extra money for tipping guides as well as pre- and post-trip transportation, lodging and dining. You'll receive a packing list from Rim Tours upon booking. They are also happy to send a packing list if you would like to see one before booking. Book confidently with Free Cancellations within 72 hours of booking. After 72 hours, cancellation fees will apply. Cancellations are subject to the full discretion of Rim Tours. For more information on our Travel Cancellation Policy please Click Here.